I credit a cosmic alignment bringing serendipity as the impetus behind this recipe. 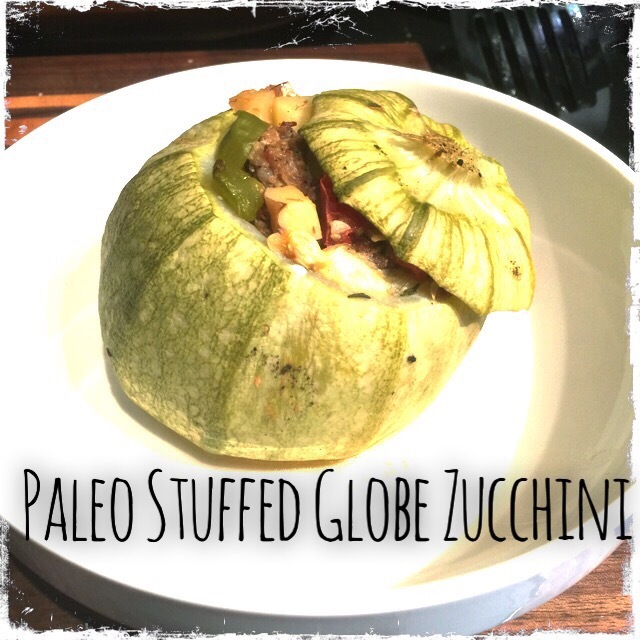 A friend of mine over at Nerd Fitness posted something a few weeks ago he was calling a grenade – from what I can remember, it involved baked globe zucchini stuffed with some sort of ground meat. 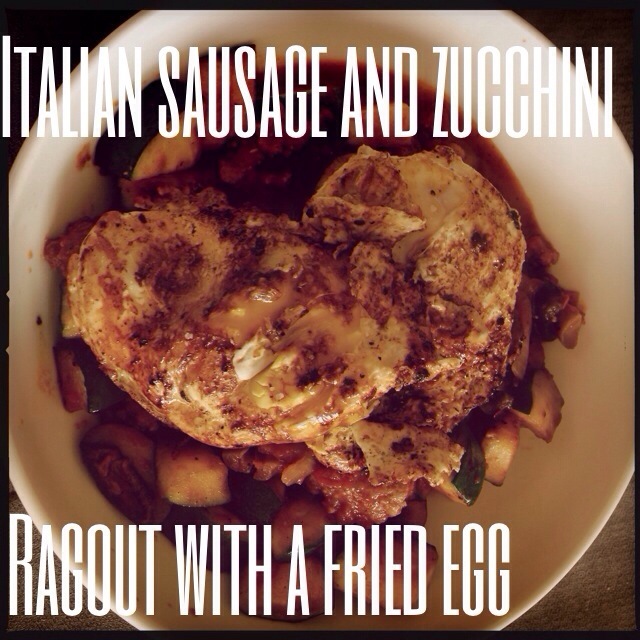 It sounded delicious, but since I had no pretty balls of zucchini on hand, I pushed it out of my mind. And then this week the stars aligned and my CSA gave us beautiful, round zucchinis the perfect size for stuffing plus ground pork. Serendipity. This recipe makes a fantastic light dinner for two, with enough innards left over for at least 1 lunch, maybe 2. 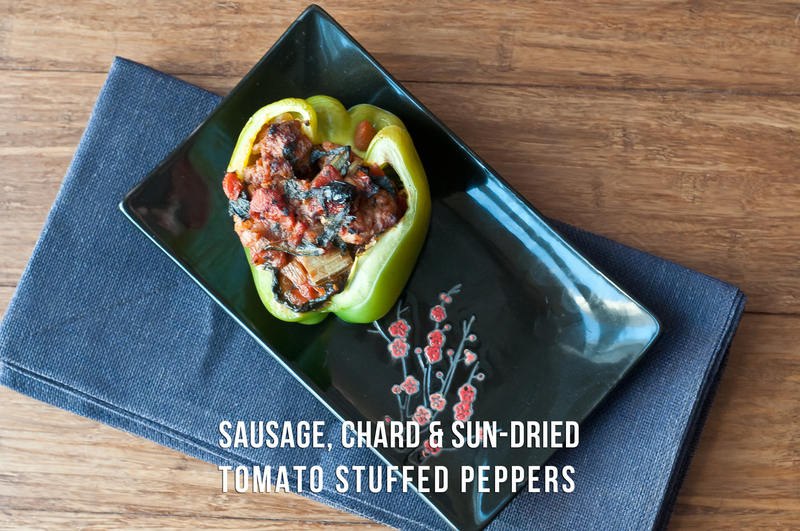 A note on sausage: I’m using a really nicely flavored sweet pork sausage here I’ve been getting from my CSA (order form). It’s fan-freaking-tastic. I would suggest swapping in the best sweet Italian sausage you can find. Preheat your oven to 375F. Set your largest pan over medium heat and add the sausage. While the sausage starts to cook, peel and dice the garlic and shallots. Add to the pan and give everything a stir, breaking up any huge sausage lumps. Dice the potatoes and add to the pan. Stir. Chop the pepper. Add to the pan and stir. Chop the tomatoes. Add to the pan and stir. Cut the tops off the zucchini. Using a large spoon, scoop the innards out of the zucchinis, being careful to not puncture the sides. Chop the innards and add to the pan. Stir. Add the coriander, thyme, a big pinch or two Kosher salt and a few cracks black pepper to the pan. Stir and taste for seasoning. Add more if necessary. Stuff the empty zucchini with the sausage mixture, replace the zucchini tops, and place in a baking dish. Add a little water to the bottom of the dish. Cover with foil. Bake 1 hour, or until the zucchini is soft. Instagram. Giving me ideas again. This recipe was inspired by the insanity above created by Josh Scherer, the evil genius behind @CulinaryBroDown. The colors. So bright. Burning into my retinas. I had to try and make it myself! According to Wikipedia, Mitraillette (literally “submachine gun”) is a Belgian dish available in little shops consisting of a substantial bun (demi-baguette – which is roughly the size of a sub bun), some form of fried meat (sausage, burger, steak, etc. ), fries, some sort of sauce (like mayo, ketchup, etc. ), and often some sort of veggie (carrot, lettuce, tomato, etc.). My version swaps diced sweet potatoes for the fries, and drops the bun. While it’s not quite “drunk food”, it is definitely delicious. First, make your pickled fennel. You’ll want to start this a day ahead (or at least 8 hours – I made mine before work). Slice your beets and fennel wafer thin (I used a mandolin) and add to a large jar (or bowl). Cover with the rice vinegar and water (make sure to cover) and add the salt, sugar and spice. Lid and give a good shake. Ideally, you’ll be able to shake a couple times throughout the day. When your fennel has pickled at least 8 hours and you are ready to serve, start by making the fried sweet potatoes. Peel and dice your potato (I used 1 small potato – 1/2 a cup diced – for one person). Add to a skillet over medium high heat with the coconut oil. Sauté a few minutes, stirring frequently. Add a big pinch kosher salt, a few grinds black pepper, the onion powder and the granulated garlic. Continue to sauté, stirring frequently to avoid burning, until the potatoes are browned and cooked through, 5 minutes or so. If your potatoes seem to be getting overly brown without looking like they’re cooking through, knock the heat back to medium. In a separate skillet over medium – medium high heat, brown your sausages (making sure to slash first so they don’t explode under pressure) and cook through. While the potatoes and sausages are working, assemble your spicy mayo by stirring the mayo & sriracha together. To serve, lay out a nice bed of potatoes, top with sliced sausages and some of the drained pickled fennel. If you’re feeling frisky, drizzle with the spicy mayo and mustard; if not, place alongside the potatoes for dipping. Serves 1 as written, easily scaled up to feed more (the fennel quantity listed can feed 2-4). Mmmmm…. stuffed peppers. When the CSA gives you pepper abundance, I can’t think of a better use of one or three than as a little bowl for some meaty goodness. Yum. Preheat your oven to 450 F. Chop your onions and garlic. In a large skillet, heat 1 Tbsp. coconut oil. Add the onion and garlic and cook until the onion is translucent. Add the sausage, slipping them out of their skins, and cook, stirring and breaking up the links, until browned. While the sausage is browning, slice the chard into ribbons and chop the sun-dried tomatoes. Halve your bell peppers lengthwise and pull out the seeds. When the sausage is ready, add the chard, hit the mixture with a liberal pinch of salt and pepper, and add the basil and oregano. Cook, stirring frequently, until the chard is wilted. Add the canned diced tomatoes and stir to combine. Let cook 3-4 minutes. Add the sun-dried tomatoes and stir to combine. Taste for salt and add if needed. Sautee an additional 5 minutes. Stuff the mixture into your pepper halves and bake 20 minutes or until the peppers are soft. It started with the best of intentions. 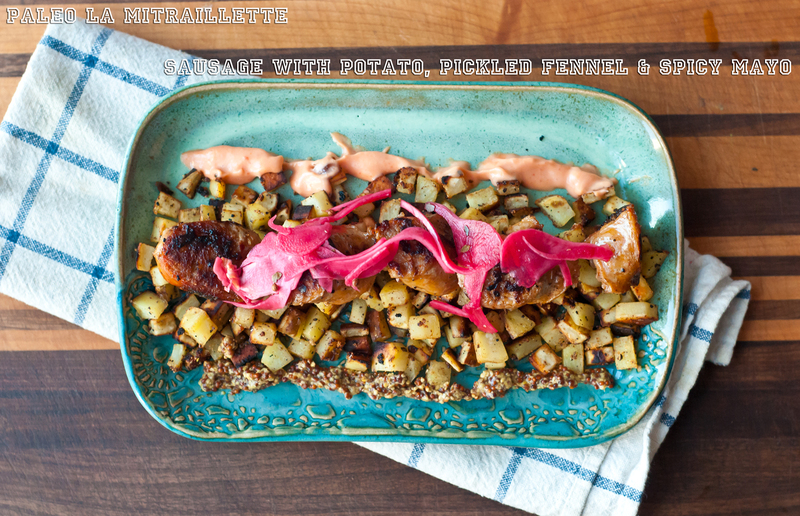 I set out to make a nice little fauxtato salad – something along the lines of this one from Health-Bent. And then I started tinkering. There are a million different ways to make potato salad – and a million different flavor profiles to choose from – but when I think potato salad, I think of mustard and crunchy celery and hard boiled eggs and summer evenings spent picking bites of cold potato salad out of the fridge. And the deli potato salad from Food Lion. And Duke’s mayonnaise. This is not that potato salad, but it filled a craving. Behold: this monstrosity pile of yummy goodness. 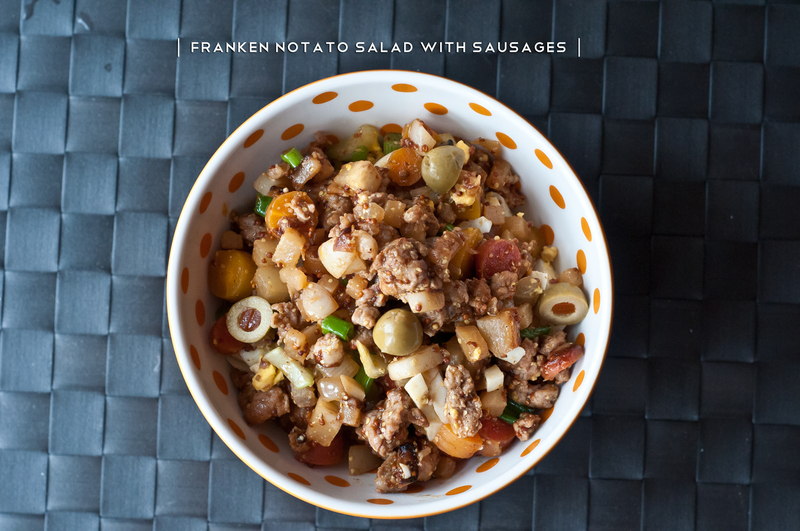 The franken salad. A dish that kind of tastes like a hybrid between german and Southern potato salads, but is definitely neither. This dish would be fantastic at a picnic or cookout, and is pretty freakin great on its own in a bowl for dinner. First, get your eggs on to boil and prep your veggies. You want everything in a fairly small dice so it cooks nice and quick. Uncase sausage and add to a large pan over medium heat. Cook, breaking the sausage up as you go, until browned. Remove from the pan and add to a large mixing bowl. While this is working, dice the celery and slice the scallions. Don’t forget your eggs, which should be finished sometime during this step. Add the mustard, cider, celery, scallions, and celery salt to the sausage bowl and stir. When the veggies are done cooking, add those as well. Taste for seasoning and add more vinegar/salt as needed. Chop your cooked, cooled and peeled egg and gently fold in. Top with halved olives, chopped parsley and chopped garlic scapes if desired. This is another example of a recipe that came about due to leftovers in the fridge + it’s cold and I need comfort + I want some freakin tomatoes in my life. One of my Nerd Fitness buddies said the description looked like exactly what he was wanting, so I figured you guys might like it too. Set a large tall-sided pan over medium heat. Slip the sausages out of their skins into the pan and break up with a spoon into small bits. Brown. Drain most of the fat and add the onions and mushrooms. Sautee until the onions are translucent and the mushrooms are beginning to break down. Add the tomato sauce and stir. Taste for seasoning – add salt, pepper and red pepper as needed. Cover. Drop the heat to a simmer and let go 20 minutes to half an hour. In a separate pan, heat 1 Tbsp. coconut oil over medium-high heat. Add the zucchini, hit with salt and pepper and sautee – stirring frequently – 5 minutes or until al-dente. Add to a bowl. Heat a Tablespoon or so of coconut oil or butter over medium heat. Add the eggs and fry to your liking, seasoning with salt & pepper as you go. To assemble: zucchini chunks on the bottom, top with a generous half cup or so of sauce, and top with the eggs. This is one of those meals where everything went wrong – I consciously decided to swap the main meat, the grocery was out of chorizo, I didn’t have as much adobo sauce and almond flour as I thought – and yet it all came together just fine into a damn tasty little dish, and not at all as meat clogged as I had thought it would be. I was expecting heavy, greasy, and to finish feeling like I’m on meat overload – happily, that was not the case here. Yeah, that’s a meaty little snowman head and a meaty little mitten – in May – what of it? That’s just how I roll. With the cool kids. Dice the onion and mince the garlic. Add to a medium pan with the coconut oil and sautee until translucent and beginning to brown around the edges. Add half the onions & garlic to a large bowl and half to the bowl of your food processor. To the bowl (not food processor), add the ground meat + sausage slipped of its casings + egg + flour + 1 Tbsp. adobo and mix by hand until incorporated. If you’re a normal adult human and have “regular” muffin tins, you will need 2 for this recipe. If you’re like me and only have 1 tin of mini muffin cups and a couple novelty tins for making holiday cakes, muddle through as you can. Whatever kind of loaf you’re making, fill your cups, making sure not to fill each cup up more than 3/4 of the way through or you will have a hot mess on your hands. A hot mess and overflowing grease. Yum. I made 1 tin of mini muffins + 1 tin of snowman/mitten muffins + 3 burger sized patties fried on the stovetop. Pop those babies into the oven and set the timer for 25 minutes. While the loaves/muffins/snowmen heads are baking, toss the tomatoes into the pan you were using for the onions and let cook until blackened in spots and beginning to pop open. Add to the food processor, along with the remaining adobo, olive oil, lime juice, and 2 big pinches of salt. Process. Taste for seasoning; adjust heat/acid/salt if necessary. At this point, if your salsa is too wet (mine was), toss back into the pan and cook some of that liquid off. Make sure to re-taste for seasoning. Add the cilantro and set aside. When your timer goes off, check the meatloaves. You’re looking for rendered fat on the top (you won’t have a whole heck of a lot if you’re working with turkey), and done looking bottoms. If you are using metal pans, you may have a nice crust. Silicone tins aren’t really into all that mess. If things look good, you’re in the clear. I was slightly worried about doneness (and was secretly hoping for a nice crust), so I jacked the heat to 400 and blasted the loaves for an additional 5 minutes. Serve over a bed of sliced avocado, topped with the relish and a squirt of fresh lime juice. 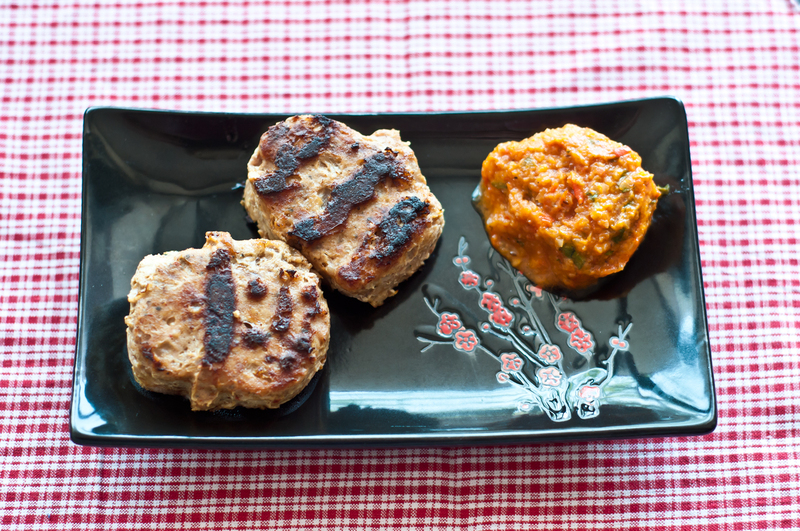 Makes a bunch – I’m getting 4-6 servings (3 mini muffins, 2 snow men/mittens, or 1.5 burger patties per serving). Your mileage may vary. Craving a rich, decadent ragu, but cutting out unnecessary carbs? This is the recipe for you. This dish is luxurious and rich, comes together in about an hour, and feels like it took days to cook. 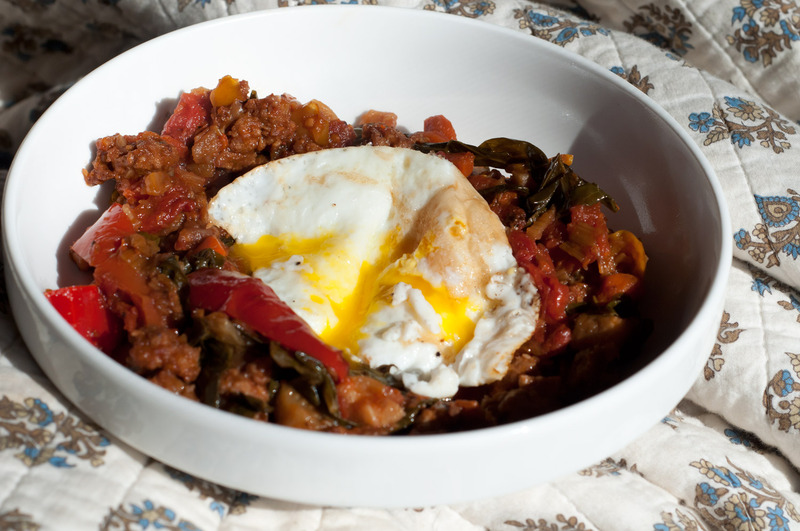 It’s meaty, hearty, and paleo friendly. It even features one of my more favorite braised vegetables, that unsung hero of the kitchen, celery. Never had cooked celery? You’re missing out. Cooked celery goes all slumpy and soft, while keeping a slight fresh taste that just speaks of crisp spring days. Yum. Cut your celery on a diagonal into 3 inch pieces. Slice the onion very thin. cut the pancetta into strips or dice into cubes. In a large pan, heat the oil on medium. Add the onion and sautee until light gold. Add the pancetta and cook until the fat becomes translucent. Add 2 links sausage, slipped out of their casings, and sautee (breaking up the sausage into bits as you go) until browned. Once everything is nice and browned, add the tomatoes and their juice, crushing as you add to the pan. Nestle the remaining 2 sausages in the pan. Add the celery, red pepper flakes, salt and pepper and toss to coat well. Pop the lid on and knock the heat down to a steady simmer. Simmer 15 minutes and check – I ended up cooking my dish for an hour in total to get the doneness I wanted; you may want to go less time if you want crisper celery. At an hour, the celery was nice and soft and the flavors were really well melded. Check every 15-20 minutes or so to make sure things aren’t getting too dry and to give a nice stir. If your mix does get dry, add some water or white wan to the pan. If the mix is too watery; take the lid off, raise the heat, and boil away the excess liquid. While the ragu is simmering, fry your eggs in butter until the desired doneness – I went for runny yolks and the dish was luscious. Yet again, I have no idea what to title this recipe. It’s a sweet/spicy/earthy/savory pile of sausage goodness heaped on top of a baked sweet potato, and it’s delicious. I made this one day for lunch with a leftover baked sweet potato that came with whatever lunch I ordered Monday from the healthy delivery place, some sausage I didn’t use with last night’s dinner (more on that later), and some of my emergency freezer greens. Dead simple, wholly satisfying, and damn nutritious. A note on sausage: Buy the best you can. If your town has a butcher, get it there. Your belly will thank you. I grew up eating sausage from the grocery store – I didn’t even know butchers still existed and that they were places I could actually visit – and since I discovered that they a: do exist, and b: are more than happy to help you, I’ve never looked back. Fresh sausage made from good ingredients is a million times better than the mass-produced crap stuffed with fillers you find with a brand on it. Except Neese’s (and to a lesser extent Bass) – if you’re from the south, you know what I’m talking about. That stuff is delicious. When we lived in Miami, my favorite sausage (that I didn’t make myself) was the hot Italian from Laurenzo’s. Now that we’ve made the move to Brooklyn, we have fallen in love with Fleisher’s. Fleisher’s makes better sausage than either my hubbs or I do, and from top quality ingredients – a win-win no-brainer. Don’t think your town has a butcher? Hit Google. I’m willing to bet it does, especially if your town has European immigrants (even “generic” immigrants that have been here for generations). Got Italians? You’ve definitely got a butcher. Eastern bloc peeps? Yup, butcher. Germans? Poles? Old people? Rednecks? Hunters? Anybody that likes traditional style foods? Butcher. Hipsters? Definitely a butcher. Even Whole Foods makes sausage, and it isn’t half bad. Not as good as sausage from a business that has been making it for forever (or a new up-and-comer that thinks outside the box), but still better than something made in a huge factory with a label. In a medium skillet over medium heat, put your sausage on to cook, breaking it up as you go. Add the onions and sautée until everything is nice and brown. Set aside. Set your broiler to high and place the sweet potato half a few inches from the heating element (5-6 inches) to reheat. If your pan is dry, add the coconut oil. If you still have some sausage fat, use that instead. Add the broccoli raab and sautée until well thawed and beginning to brown, adding the garlic about halfway through. Salt & pepper to taste. By now, your potato should be warm and just starting to turn golden at the edges. Pull it from the oven and sprinkle with the chili powder, curry, and chipotle powder. 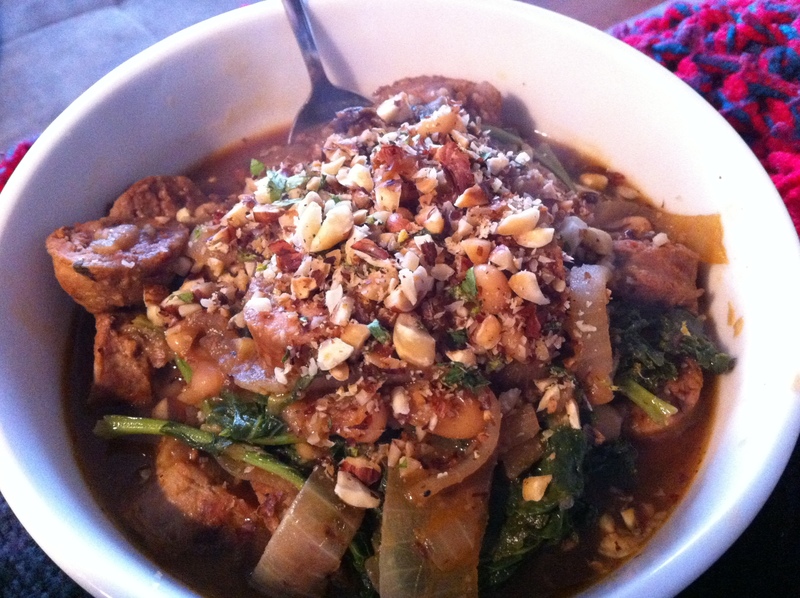 Top with the broccoli raab and sausage. I’m on a bit of a runny egg kick. Blame it on the weather (we got snow in NYC this last week thanks to my first Nor’easter since moving back up to the frozen North), but I want runny yolks and the silky body they bring to otherwise humble ingredients. The main portion of this dish was initially supposed to be a more runny tomato ragu, but since I inexplicably fail at making any form of marinara, it turned out more substantial – almost like a stew, but not quite as wet. This is a main that needs no starch for backbone – it gets along just fine without. Gluten-free & paleo-friendly. Add all your chopped veggies to a enamel dutch oven or other heavy-bottomed pot set over medium heat with a bit of coconut oil in the bottom. Sautee, stirring often to avoid burning and deglazing the pan with white wine if things are getting too sticky, until the whole mess is nicely browned and cooked way down. The finer you chop the veg, the quicker the cooking will go – I like roughly 1/2 inch pieces or a little under. I’m not 100% sure how long my veggies took to cook, but it was awhile. Maybe half an hour? 45 minutes? You’re looking for a color here, not a time. Everything should look deeply caramelized, and kind of melted together. Not burnt, but nice and brown and cozy. While all that is happening, get your additions going. Slip your sausage links out of their casings and sautee in a large pan, breaking it up as you go. Remove to a towel to drain. Add the pepper and collards to the sausage fat and sautee until softened, about 10 mins. Taste everything for salt at this point and add if needed. When your veggies are cooked down to your liking, add the sausage, collards, and pepper to the pot. Open your can of tomatoes and crush each one into the pot. Alternately, you can crush these separately with a potato masher, but where’s the fun int that? Add the liquid from the can along with the red pepper flakes, pop the lid on, lower the heat, and simmer 30 minutes. 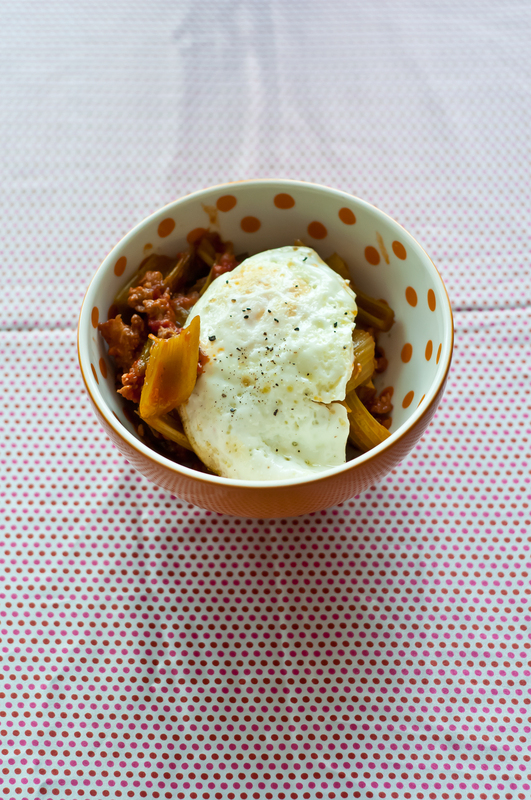 To serve, spoon into a bowl and top with two fried eggs. This makes a satisfying and surprisingly hearty weeknight meal for two. Put a large pan over medium heat. Add the sausage and cook until browned on all sides. Remove from the pan and set aside. Put the pan back over the heat and add 1 Tbsp olive oil and the onions. Sautee until softened and beginning to brown. Add vegetable stock, tomatoes, cannellini beans, bay leaves and kale. Sautee 10 minutes or until kale is wilted. While your kale is working, slice the sausage into bite-sized rounds. During the last 5 minutes of cooking, add the sausage, thyme, preserved lemon and vinegar. Taste. Salt and pepper if needed. Top with hazelnut gremolata and serve. Serves 2 for dinner with a little left over for lunch. Toast 1/2 cup hazelnuts in a 350 degree oven for 6-8 minutes or until browned and smelling nutty. Cool & chop rough. Add to a bowl with 3 Tbsp. finely chopped parsley, the zest of 1 lemon, 1 clove minced garlic and a big pinch salt. Toss a handful in anywhere you want a nice nutty crunch or need a hit of protein.